BEHR Premium DECKOVER Cleaner is ideal for cleaning and brightening areas coated with DECKOVER coating. Use this product on exterior surfaces coated with DECKOVER including Decks, Fences, Siding, Patios, Walkways, Porches and Boat Docks. Ideal for use on grime and most fluid stains. Cut'N Seal is a brush-on sealer and moisture repellent for cuts & holes that expose untreated wood. Water-based formula has low VOC & odour, is ready to use with soap & water cleanup. Use on above ground decking, post tops, fence boards. The fine point applicator allows easy bonding of rhinestones, gems, sequins and other embellishments to most porous and semi porous materials such as paper, cloth, wood, pottery and more! Acid-free, no run glue formula that dries clear. Restore 10X Advanced Resurface offers superior weather resistance and ultimate water repellency protecting the surface from the harshest of weather conditions. It is formulated to resurface all wooden decks and most composite decks and concrete patios. Restore 10X Advanced Resurface locks down splinters and fills inch cracks, making a safe yet extremely durable surface. Super Remover DS is an effective GEL remover perfect for horizontal and vertical surfaces. It removes all types of paints, household and industrial varnishes, epoxy, aluminum oxide and even all types of glues. Its unique formula allows it to stay humid and active much longer on tough surfaces that renders it practically odourless, it is the ideal product for interior or exterior use. Super remover can be neutralized with water, which is convenient if it were to come in contact with skin or any undesirable surface. Available in Quebec stores only. 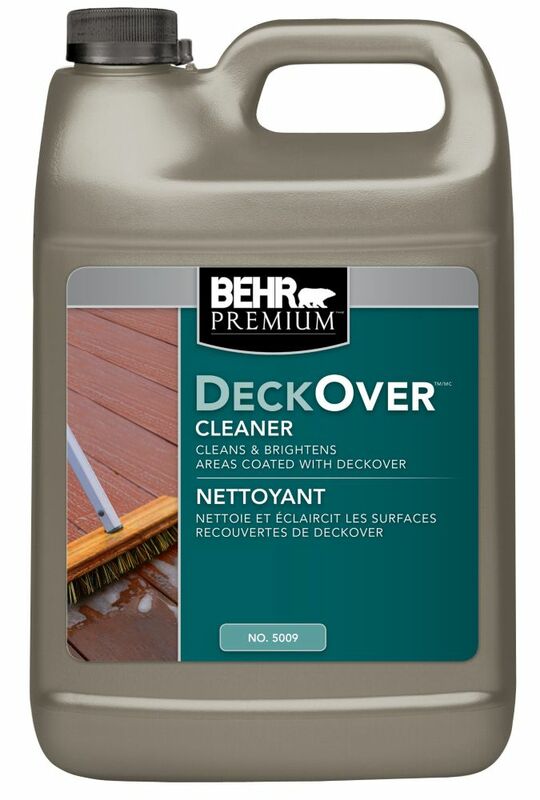 DeckOver 3.79L Deck Cleaning Solution BEHR Premium DECKOVER Cleaner is ideal for cleaning and brightening areas coated with DECKOVER coating. Use this product on exterior surfaces coated with DECKOVER including Decks, Fences, Siding, Patios, Walkways, Porches and Boat Docks.